World 5-1 is the first level of the fifth world in New Super Mario Bros. 2. It is a level that takes place mostly on colored mushroom blocks in the sky. Many Koopa Paratroopas appear as well as tightropes. Mario begins on several colored blocks below a tightrope. 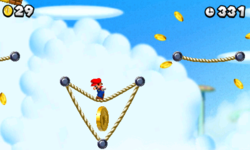 Coins surround most of these tightropes, allowing Mario to collect them. Mario first has to cross an abyss by jumping on several tightropes. When Mario walks on tightropes, the rope lower a little due to his weight and he moves slower, but it also allows him to jump to high places or objects when timed and positioned correctly. Standing on a tightrope for too long causes Mario to drop off the rope and, in most cases, cost him a life when no platform is below it. On the third tightrope from the beginning of the level, there are several Brick Blocks and ? Blocks orbiting it. One of the ? Block contains a Super Leaf. Above this rope, there is another rope with a multi-coin Brick Block above it. Koopa Paratroopas then appear, orbiting around several tightropes as an obstruction to Mario. The next tightrope features orbiting Brick Blocks above it, while the next one has a Gold Ring above it. There is a Koopa Troopa on that tightrope, which allows Mario to collect coins automatically by kicking it, allowing it to bounce off the ends of the tightrope. Right after that is the checkpoint. Mario can find another Super Leaf in a ? Block orbiting the next tightrope. The player can then see the second Star Coin. More Paratroopas appear, obstructing Mario on the tightrope. After crossing some more tightropes, another Gold Ring can be found, allowing Mario to execute the earlier stated trick on collecting coins automatically. A Coin Roulette Block then appears, followed by the Goal Pole. Star Coin 1: There are several orbiting Brick Blocks above the tightrope just after the one where Paratroopas first appeared in the level. Mario needs to get on one of them and quickly jump to reach the Star Coin in the center of the circling Brick Blocks. Star Coin 2: This Star Coin can be seen enclosed in tightropes right after the checkpoint. Mario just have to stand on the top tightrope until he falls onto the Star Coin. A more tedious method involves having Raccoon Mario to fly from the bottom tightropes to the Star Coin. Star Coin 3: There is a high tightrope above the yellow block after the checkpoint. Mario has to bounce off one of the tightropes to the left or right to reach that tightrope. Mario then has to jump around to find a hidden block, somewhere above the center of the tightrope. This causes a Beanstalk to grow, taking Mario to a secret area. Here, Mario can find a multi-coin Brick Block above a tightrope. To collect the Star Coin, Mario must carefully bounce off the Paratroopas which are in the same orbit as the moving Star Coin. This exit is in the same secret area as the third Star Coin. Mario has to travel to the area described above. After the Paratroopa ring, there is another tightrope on the right. Mario has to bounce around again to find a hidden block which grows another Beanstalk. Mario has to travel upwards, then drop down the narrow shaft on the right. Here, Mario also needs to bounce off many Paratroopa rings to cross a gap. After the gap, the Goal Pole can be found. This exit unlocks World 5- . This page was last edited on April 9, 2019, at 18:02.